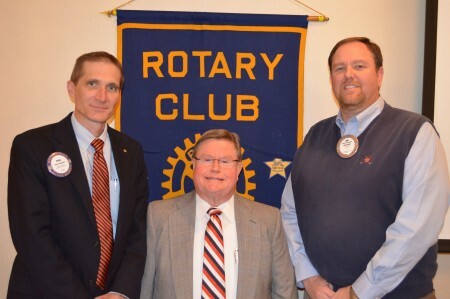 Dr. Gary Waters (center), senior associate athletics director for academic services, spoke to the Auburn Rotary Club on academic programs designed to support Auburn University’s student-athletes. The Athletics Department’s Student-Athlete Support Services provides direction for student-athletes via tutoring and supervised study, career planning, monitoring of eligibility status, and a host of other guidance and advisory services. Pictured with Waters is program host Paul Patterson (left) and Club President Jim McLaughlin (right).